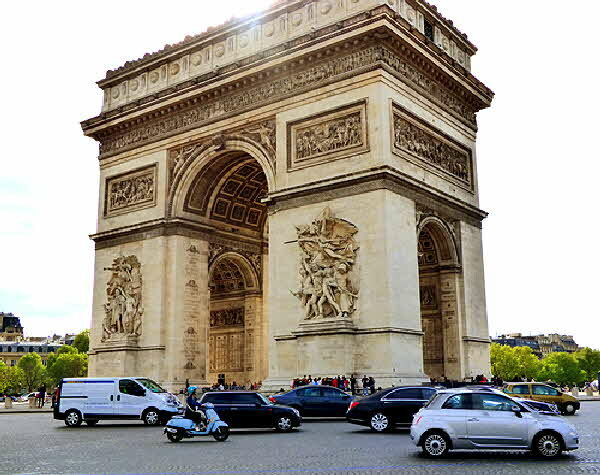 In the Golden Triangle, at the very heart of Paris, just steps away from the Arc de Triomphe and the Champs Élysées, is the 5-star Hotel Napoleon. 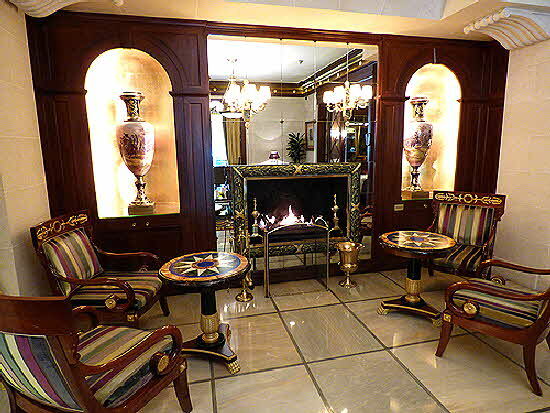 As soon as the cab unloaded our luggage it was swept away by a smiling doorman who led us into the elegant lobby inspired by the design style of the Napoleonic period. 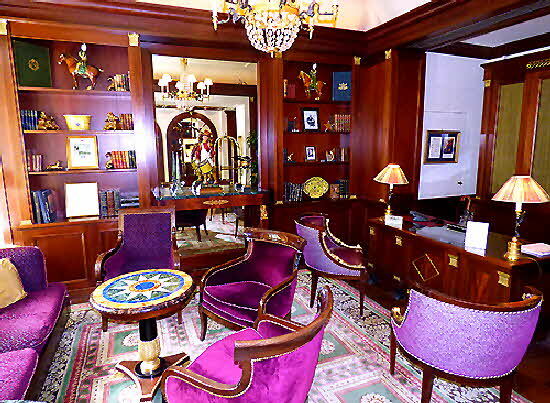 In fact, the entire hotel is a testament to Napoleon’s First Empire, thanks to the owner’s personal collection of Napoleonic memorabilia. The friendly demeanor of the staff from the head Clefs d’Or concierge to the smiling doorman, softened the formal look of the premises and made us feel right at home. The charming story of the hotel’s history seems to have been torn right out of a romance novel. It began with a rich Russian entrepreneur, Alexander Pavlovich Kliaguine, who immigrated to France in 1915. He fell madly in love with a French student and bought the hotel as a wedding gift for his young bride in order to launch her into the high-society of the day. The hotel, located in the center of Paris’ elite 8th arrondissement (neighborhood) became the center also of Paris thriving Russian cultural life due to Alexander’s expat contacts. The centrally located hotel also attracted international actors, writers and artists, who frequented Paris in the artistic renaissance between the World Wars. The hotel opened in 1928 and has remained in the Kliaguine family to this day, making it the only 5-star hotel, out of the many deluxe hotels located in the 8th, still independently owned. Gilded medallions decorate the dark brown furniture and beamed ceilings in the lobby with its two large sitting rooms separated by lavishly draped thresholds. This neoclassical design is replicated in all of the rooms and suites which can be connected in any number of configurations to accommodate the various needs of the Napoleon’s guests. Since the Hotel is privately owned it does not have to conform to the design standards set by faceless corporations and so each room is a different variation on the theme. Many have sweeping silken drapes decorating the bedrooms at both bed and window, with Napoleonic paintings and artifacts coordinated to the featured color scheme. Under the guiding hand and impeccable taste of General Manager, Ludovic Corpechot, the hotel underwent a refurbishment that earned it the coveted fifth star along with kudos for its comfort and luxury. 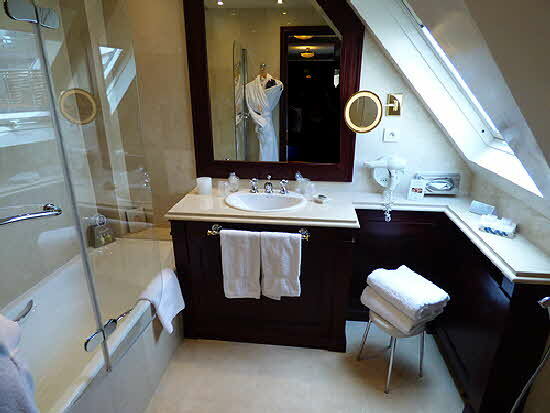 The plumbing is state-of-the art with English style rain-shower heads in the beautifully appointed marble bathrooms stocked with large fluffy bath sheets as well as bathrobes and slippers - some have heated towel racks - and all are well-lighted with generous sized L’Occitane amenities. In keeping with its deluxe status, room-service carts are not seen in the hallways but service is conveniently available 24 hours a day. 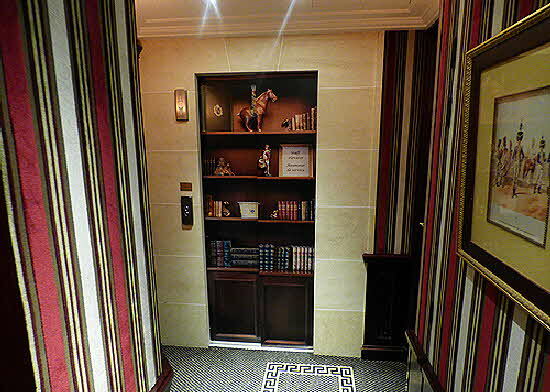 The attention to detail is such that service elevators are disguised with trompe l'oeil wallpaper that make the doors look like bookshelves with books and bibelot. There is a business center; various sized meeting rooms, and a fully equipped fitness center with a complete line of spa services. There are smoking and non smoking floors and small pets are permitted. On the other hand the hotel is ecologically green and uses anti-allergic linens. There is free Wi-Fi available in all areas. While many of the 51 rooms and 51 suites face the Arc de Triomphe with striking views of the Eiffel Tower, the Sacré Coeur and the famed rooftops of Paris, we enjoyed the quiet comfort of the Josephine Suite which faces into the landscaped interior courtyard. 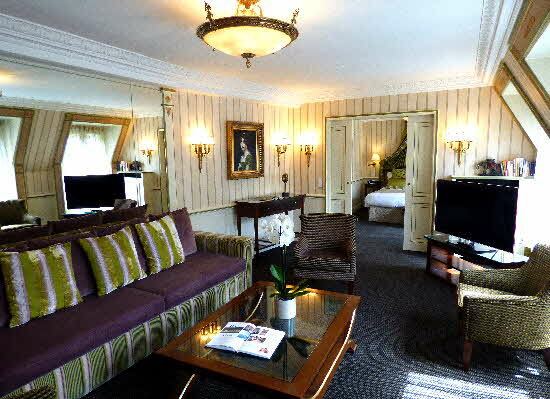 The spacious living room leads into an elegantly appointed bedroom with a king-size bed, a separate dressing room, two bathrooms and many pictures of Napoleon’s consort Josephine; leading me to believe the suite was named in honor of Empress Josephine. I was surprised to learn that it was named instead for Josephine Baker, the American entertainer that was so beloved by the French and frequented the hotel in the 50s. 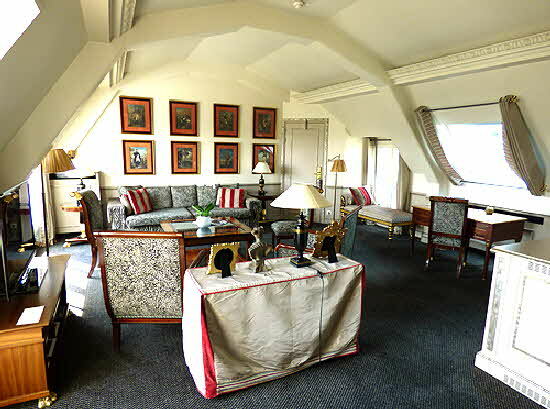 The Youssoupoff (Yusupov) Suite is named for Prince Felix Youssoupoff, an early guest in the hotel and a personal friend of owner Alexander Kliaguine. One of my most fascinating experiences in Russia was visiting the Yusupov home in St. Petersburg and seeing the “secret” basement where the assassination plot against Rasputin was hatched and carried out. He resettled for a time in Paris after the revolution, along with hundreds of other White Russians (anti-revolutionary) royalty and otherwise. The Imperial Suite is located on the top floor of the hotel with stunning views, a private terrace, a massive living room featuring designer fabrics, and with every comfort and luxury modern technology can provide. Continental or full-service breakfast is available in the Le Bivouac Café and a traditional French menu is available for lunch and dinner that is changed according to the seasons... four different menus per year. The Bivouac Café, in keeping with the Napoleonic history, is named after the encampments where he and his soldiers rested between battles. It is a cozy and relaxed environment where service is impeccable. Le Bivouac offers classic Parisian cuisine. Cuisine Parisienne is named after the simpler taste of the middle class of 19th century Paris -- in contrast to the aristocracy’s “grande cuisine”. It means fresh food, fairly simply prepared that preserves the foods' natural flavors. 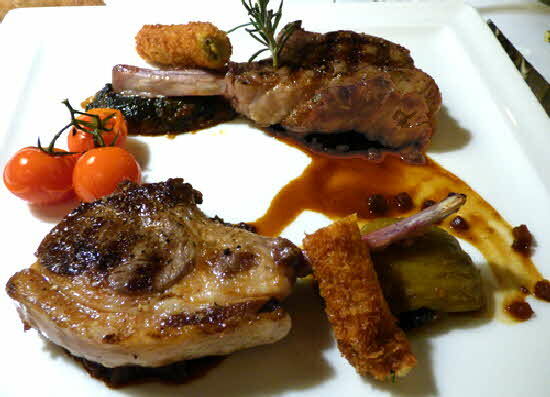 Chef Olivier Legentil creates a subtle harmony of tastes with the freshest ingredients. 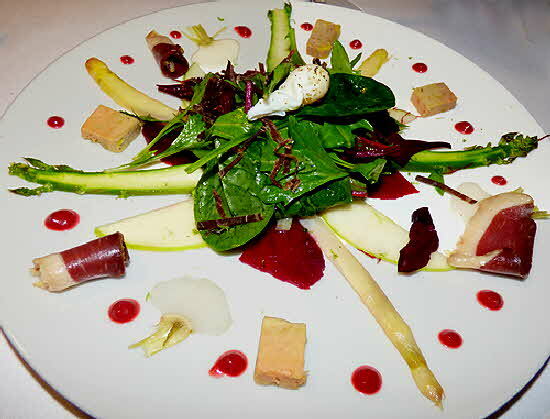 I started with a green salad made of smoked duck breast 2 ways (both slivered and rolled in paper-thin slices), fresh baby spinach in the center topped with a poached quail egg, green and white asparagus, thin green apple slices, thin slices of beetroot and cubes of foie gras; the plate’s rim was decorated with slices of pickled baby turnips and dots of a blend of honey, lemon and beet essence making a delightful sauce. Barbara had the duet of asparagus (green and white) on puff pastry with a rich hollandaise sauce. My lamb chops were perfectly cooked -- saignant just as ordered -- and had just the right amount of fat surrounding the succulent rib eye. This is very important because when they are cooked, too much melting fat would make them heavy and soggy; too little would leave them still tough. They were resting on a purée of braised pak choi cabbage, and garnished with grape tomatoes and a rosemary branch. Excellent! 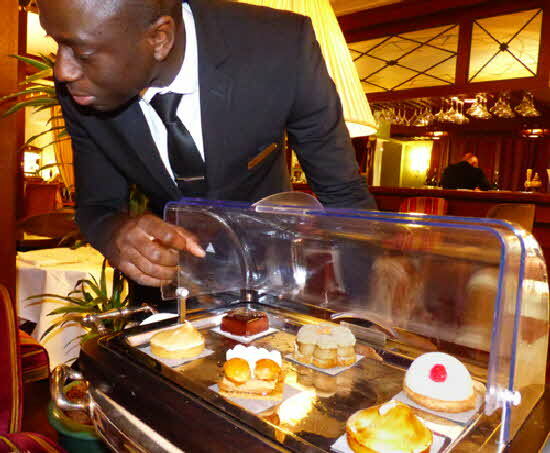 The pastry cart was rolled over and we had difficulty deciding what to have. All pastries, sourced from Philippe Conticini’s la Pâtisserie des Rêves, are exceptional tasting with aromas and flavors of the season. We ended up with cake St. Honoré; a circle of puff pastry with a ring of pâte à choux piped on the outer edge. After the base is baked cream puffs are dipped in caramelized sugar and attached on top of the circle of the pâte à choux. The base was filled with crème chiboust and finished with whipped cream. The wine list is rather small but very well thought out to pair with the kitchen’s offerings, as they change with the seasons; and I noticed a number of exceptional Left Bank vintages. I loved the Margaux. We left the Napoleon saying goodbye to all our new friends and promising to return on our next visit to Paris...€ the city of lights and warm memories.